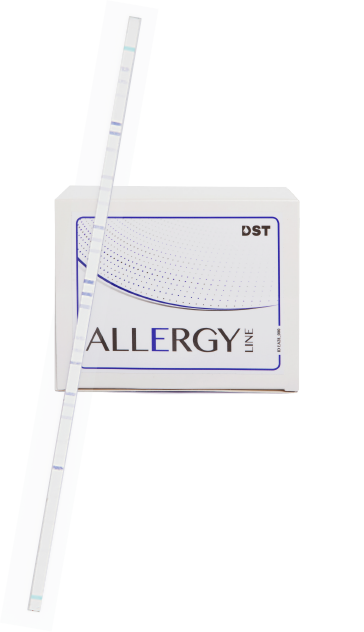 The ALLERGY LINE Kit from DST GmbH for the detection of specific IgE (human) is a cost effective and reliable laboratory use enzyme immunoassay for in-vitro allergy diagnostics in line strip format. The assay is used for the quantitative determination of specific lgE antibodies against a selection of relevant allergens for the serological diagnosis of type 1 allergies (immediate type) in patients. Multiple panels of inhalation and food allergens are available. Allergens of the dedicated panel are embedded in nitro-cellulose strip membranes. For testing, a diluted sample (serum or plasma) is added to the incubation tray. Specific IgE antibodies of the sample bind to the spotted antigens on the membrane during incubation, and non-bound components of serum or plasma are washed away after incubation. Subsequently, digoxigenin-labeled anti-human IgE antibodies and horseradish peroxidase coupled anti-digoxigenin antibodies (conjugate) are added. The digoxigenin-labeled anti-human IgE antibodies bind to IgE antibodies of the sample and the standards. The conjugate binds to the digoxigenin-labeled anti-human IgE antibodies. Subsequently, unbound detection antibodies are washed away. A color substrate TMB (3,3‘, 5,5‘-tetramethylbenzidine) is added, which is converted by the horseradish peroxidase. The reaction is stopped by adding a stop reagent. A dark colored dye is formed and the respective intensity correlates with the proportional amount of locally-bound antibody. The dye formed can be quantified photometrically by measuring the extinction. The quantification of the tests is carried out using a point-to-point regression of a 3-point standard curve. Standards are calibrated according to the WHO reference serum 75/5021. The identified kilo units/L can be assigned to the respective CAP-classes and provide the level of specific IgE sensitization (See table below).